Made with fruit. Perfect for snacking & lunchboxes. No artificial colour or flavours. 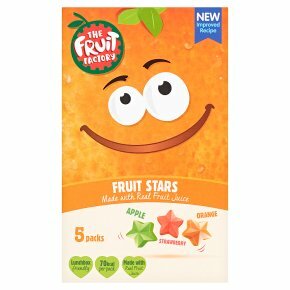 Suitable for vegetarians.Gummy fruit shapes made from apple, strawberry and orange juices from concentrate with sugars, pectin, modified starch and natural flavouring. Want to know... why the fruits from the Fruit Factory always have massive grins on their faces? It's because they're bursting full of fruity, juicy fun!